Mounting evidence suggests that socioeconomic status is a determinant of health. As nations around the globe increasingly rely on market-based economies, the corporate sector has come to have a powerful influence on the socioeconomic gradient in most nations and hence upon the health status of their populations. At the same time, it has become more difficult for any one nation to influence corporate activities, given the increasing ease with which corporations relocate their operations from country to country. As result of all of these factors, nations wishing to assure the health of their populations will need to both involve the corporate sector and cooperate with other nations. 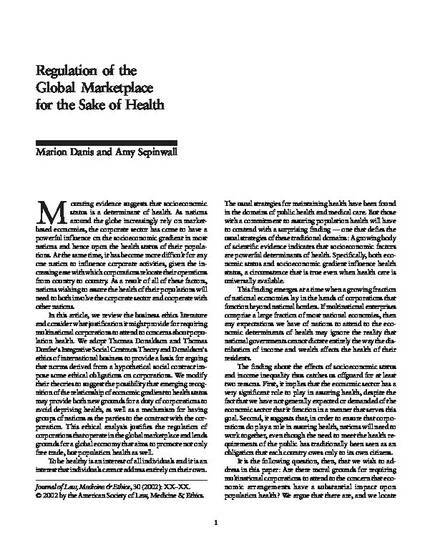 In this article, we review the business ethics literature and consider what justification it might provide for requiring multinational corporations to attend to concerns about population health. We then adopt a version of social contract theory to justify the regulation of corporations that operate in the global marketplace, and advocate for a global economy that aims to promote not only free trade, but population health as well.